Default font text with *. \firaseries This is text in Fira Code with *. This should not be red. As you can see, the * characters are way too low when used in the listing. 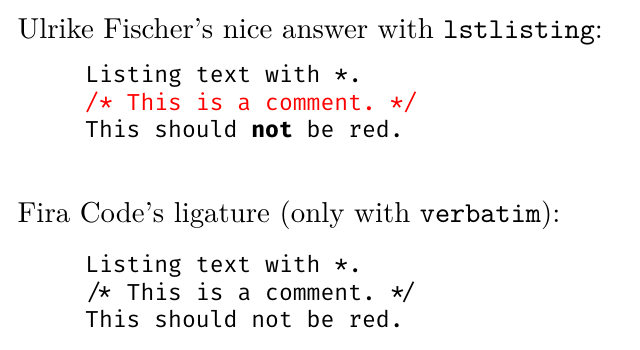 This yields the desired vertical position but unfortunately, it creates a new problem: Now the text after a multi-line comment is also red. I would very much appreciate any pointers on how to fix this problem. The hyphen-minus symbol is wrong, too. In fact, it is replaced with a math mode minus $-$ by the listings package. Don’t load Fira Code via \newfontfamily. Instead, load the font via \setmonofont and use basicstyle=\ttfamily. This signifies Fira Code as a monospaced typeface and prevents listings from replacing certain symbols. Not the answer you're looking for? Browse other questions tagged listings luatex fontspec code or ask your own question.